100 YEARS OF SERVICE FOR GIRLGUIDING. 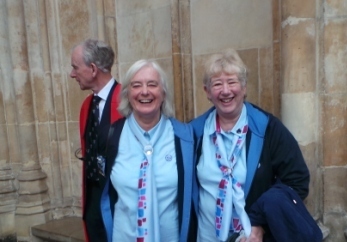 Two Island Guiders who have both completed 50 years service for Girlguiding (Julia Downer and Rosemary Walls) have recently been honoured to attend the National Scout and Guide Service of Celebration and Thanksgiving at Westminster Abbey. This service focuses on thanking adult volunteer leaders and supporters for their service and dedication and was attended by 2,000 Scout and Guide members. Julia and Rosemary joined Girlguiding as Brownies with the 8th Ryde (Methodist) unit and later became Guides and Sea Rangers. During their time as Sea Rangers they helped to build “Little Rascal” a 10ft. Rowing boat. 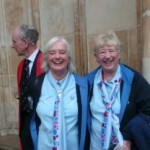 Later Julia became a Leader with the 8th Ryde Guide Company and later still re-started the 1st Binstead Guides. She now helps with the 1st Binstead Brownies. Rosemary (Rose) Walls became Tawny Owl at 8th Ryde Methodist Brownies, then Brown Owl. Later as her family arrived she became an Assistant Guide Guider at 5th Ryde and this was followed by taking over the Brownie Pack when the previous Brown Owl left. In 1996 Julia and Rose also became joint District Commissioners for Ryde District– a position they held for 7 years. Julia also took on the position as Camp Adviser for many years. Rose took a break from active guiding for a while and became District President but the love of Guiding got the better of her and she returned to Binstead Rainbows as a helper – a post she still holds.